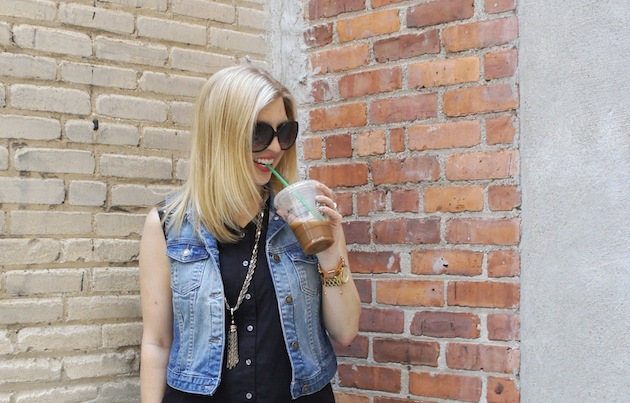 You may remember I recently wrote about how I'd be wearing this denim vest all summer. Well, I wasn't kidding! I've been throwing it on over every sundress I own - it's an easy way to add a layering piece without a lot of bulk (and who wants bulk in July?). Seriously, LBD + vest + Keds = chic, cool summer outfit! See another way to style a denim vest here. See more ways to wear Keds here and here. For more outfit ideas, visit TBF's How To page! Love. Took the plunge and purchased one, now can't get enough of it! Send more and more outfit ideas my way lady!! Yes! Such a great summer wardrobe update. And they come in any number of price points! Like this cool, ombre vest, for $17, or this one, on sale for $20. And I am loving this, and also this epic cool vest from Rag & Bone! Loving the denim vest this year! So versatile!